Learn more about growing lavender from Lavender Fields in Valley Center, Calif. The business has provided its owners with a serene place to work, live and dream. Audrey Pavia is a freelance writer based in Norco, Calif. Imagine a sea of pale gray-green plants crowned with a powdery purple hue, growing on a small California hillside. Stretching out in well-manicured rows, the plants wave softly in the dry, warm breeze. Beyond them are hills covered with chaparral in some places, fruited orange groves in others. As you breathe in, you smell an exotic, sweet and tangy scent that lingers in the air, giving you the sensation of being in a place that is both serene and stimulating at the same time. Welcome. You are at The Lavender Fields. When Ellen Sullivan and Paul Bernhardy started The Lavender Fields in 1998, they had a vision of a peaceful place where lavender grew and was harvested for its beautiful flowers, essential oils and therapeutic floral water. The couple loved the herb’s appearance and fragrance, but also its hardiness and suitability for the Southern California climate. After purchasing a nine-acre farm in the hilly region of northern San Diego County, the husband-and-wife team started their crop from cuttings taken from neighbors’ lavender plants. Six years later, the couple’s organic hobby farm has grown to include a viable business that employs Ellen full time. The Lavender Fields now sells products made from lavender online, hosts an annual lavender festival, and offers classes on cooking and crafts-making using lavender. Ellen and Paul started propagating lavender in 1999 after building a potting shed. Using cuttings from one-year-old plants, the couple soon found themselves with 3,000 starter plants. In no hurry to put the young, vulnerable plants into the ground, Ellen and Paul constructed a small shade house designed to help “harden off” the baby plants. The starter plants moved from the potting shed to the shade house and stayed for four weeks. In May of 2000, the young plants were ready to go into the ground and were carefully planted. By fall, the new lavender was blooming. The flowers were then cut by hand, dried and hand stripped. This fall harvest reaped enough buds to make a number of dried products, such as sachets, wreaths and dried floral arrangements. The remaining flowers were processed in a small copper distiller for their oil and floral water, to be used in lotions and body mists. Ellen and Paul found success with their new product line, which inspired them to expand the business. The Lavender Fields now features three fields of lavender, a 600-square-foot greenhouse and a 100-gallon distiller. A gift shop sells the farm’s products to visitors during the months of May and June when The Lavender Fields is open to the public. The products are available on the farm’s website all year long. Paul (who is employed full time as an executive) and Ellen do all the work on the farm with the assistance of only one full-time employee, who also helps care for the couple’s livestock. Lavender played an important role in World Wars I and II. The oil from lavender plants was used widely as an antiseptic because of a shortage of medical supplies. Private growers in England provided the lavender from their farms, and citizens collected the plant in the wild as part of the war effort. Before the advent of modern medicine, people kept lavender as a medicinal staple. It was used to relieve muscle aches and pains, nervousness and to promote the appetite. Testing has shown that lavender oil has antibiotic properties and can kill Pneumonococcus and Streptococcus, along with other bacteria. Although lavender is most commonly found in the wild in areas bordering the Mediterranean Sea, lavender species also grow on Atlantic islands. When you look at the properties of lavender, it’s not hard to understand why Ellen and Paul were so drawn to this hardy herb. The history of lavender use begins 2,000 years ago with the Greeks and Romans, who used this native Mediterranean plant to scent soaps and bath water. Long recognized for its therapeutic properties, lavender has been used through the centuries to treat headaches, sore throats, wounds and anxiety. This fragrant plant is also treasured for its beauty. The hundreds of species of lavender growing in the world come in various shades of green foliage, most with soft purple flower stalks that reach toward the sun. Ellen and Paul’s method of cultivating and harvesting lavender is based on the farm’s organic principles as well as the couple’s own personal preferences on how to handle their crop. All of The Lavender Fields’ plants are propagated from cuttings taken from mother plants. These cuttings are kept in a frost-free, well-ventilated area for about eight weeks in a slightly damp sand/perlite mixture. After the cuttings take root and frost danger has passed, the plants are taken to the shade house for further growth. The plants are moved to the ground a month later and are irrigated to keep the roots damp—a vital step in preserving the life of the plant within its first year. The fast-growing plants bloom soon after planting, and Ellen and Paul prune throughout the summer to keep the root systems strong. One reason Ellen and Paul’s lavender grows so well is the Southern California climate. A plant that thrives on nearly constant sun, lavender needs at least six hours of sunlight per day to bloom at its best. Good soil drainage is also a priority, since root rot is one of the few problems that can affect the lavender plant. Soil from 6.5 to 8 pH is best for lavender, and Ellen and Paul have found that few soil amendments are needed at this pH range. Mature lavender plants don’t need much water, so Ellen and Paul drip-irrigate the fields only about every 10 days during the hottest and driest period of the Southern California summer. Because The Lavender Fields is an organic operation, all weeding is done by hand and hoe. Bees pollinate the plants, and ladybugs and birds keep pests at bay. In France, where lavender is grown in vast amounts, scything is the method of choice for harvest. Because The Lavender Fields has a much smaller crop each year, the flowers are instead harvested with Japanese sickles and by hand. Harvest takes place in the summertime when the plants are at full bloom. A second harvest crop is ready for the taking in the fall. Because The Lavender Fields produces a number of different products, the processing of the lavender varies depending on its intended use. Among the items offered by The Lavender Fields are bottled floral water, lavender-heat pillows, bottled essential oils, body mist, herbal face cream, body lotion, soaps, powders, bath oil, bath tea, a variety of baby products, beaded and closet sachets, honey-lavender candles and bulk lavender buds. When harvesting buds to use in products calling for dried lavender, Ellen and Paul wait until the lower third of the flower has bloomed. They cut the flower during the day, after the dew has dried, to avoid moisture inside the plant bundle. Bundles consist of approximately 100 stems banded together in the field. They hang in the potting shed for weeks to dry, and are then sold as bundles or stripped for the buds. The Lavender Fields creams, lotions and body mists and other liquid-based products require harvesting for oil and floral water, and so a different harvesting method is used; the flowers are taken later in the summer to allow the oil to gather within the maturing flowering heads. Ellen and Paul do their own distillation on the property, using unique methods developed to get both oil and floral water from the plants. The distillation process is an important part of the work at The Lavender Fields, and involves extracting oil from the flowers using steam distillation. The farm’s steam distillation system generates steam in a separate boiler, which is piped into the bottom of a stainless steel distillation vessel that contains the lavender. The steam rises up through the lavender that has been compressed into the retort, extracting oil from the plant as it rises. The temperature of the steam is well controlled so it is just enough to force the plant material to produce the essential oil but is not so hot that it burns the plant material or the oil. Steam then exits through a hole in the lid of the retort, and is forced into the cooling condenser, where it cools and returns to liquid. The oil and water are then separated after they flow through a Florentine flask. After the oil and water are separated, oil is kept in an amber glass bottle to age for several months before being used. The floral water is sealed in white buckets out of direct sunlight until used for The Lavender Fields products. Preheat oven to 350 degrees F. Cream butter and brown sugar together and add the flour, nuts and lavender. Reserve one cup for the topping. Press remaining mixture evenly over the bottom of an ungreased 8” square pan and bake for 15 minutes. While crust bakes, prepare the filling: Beat together the granulated sugar and cream cheese, and beat in the egg and liquids until smooth. Pour over the baked crust and sprinkle evenly with the reserved topping. Return to the oven and bake 25 minutes. Cool on rack for a few minutes and cut into squares and cool completely. Store covered in the refrigerator for two days or freeze for longer storage. Source: 2002 Lavender Festival Cooking With Lavender booklet by Karen England, available through The Lavender Fields. At The Lavender Fields, Ellen and Paul do more than just cultivate lavender for their products. They also educate the public about this special herb in a variety of ways. The Lavender Fields Annual Lavender Festival is one of the ways people can discover the magic of this plant. Visitors can tour the fields, gather flowers by hand and learn the various ways of using lavender in cooking and crafts. They can listen to live music, seedemonstrations of lavender essential oil distillation and purchase plants on site. Classes on crafting with lavender are available throughout the summer. Students pick their own materials for making baskets, wreaths and other items. Lavender can also be used for cooking, and classes on how to use the herb in a variety of culinary delights are offered at the Fields. Students discover which lavender varieties are best for cooking, how to make infusions and teas, and how to use dried lavender on everything from meat to desserts. Both the crafts and cooking classes are held on the wrap-around porch of Ellen and Paul’s home, which features views of the hills surrounding the farm. Ocean breezes from the west cool students in the hot summer months as they overlook the fields below. For groups wishing to visit The Lavender Fields at various times of the year, guided tours are available. The 90-minute tour includes the history of The Lavender Fields, an explanation of the planting process and growing cycle, a description of the varieties of lavender grown on the farm, a tour of essential oil distillery and a chance to shop at the farm market for handcrafted lavender gifts. One of the most recent additions to the farm’s offerings is a labyrinth—a spiritual walking path, formed from English Munstead lavender. The seven-ring labyrinth is 50 feet in diameter, and offers visitors to the farm the chance to walk through the sweet-scented plants. Although lavender is obviously Ellen and Paul’s primary focus, The Lavender Fields is also home to the production of sheep’s wool for weaving. Ellen, a dedicated weaver, weaves museum-quality Navajo-style rugs in a small workshop adjacent to the couple’s home. The wool comes from their flock of seven Navajo-Churro sheep. A rare breed that once numbered in the thousands on Navajo land in Utah and Arizona, Navajo-Churro were destroyed in vast numbers in the 1860s by the U.S. Army in an effort to subjugate the Navajos. 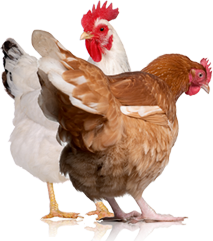 The breed now exists in small, scattered flocks around the country. Each year, Ellen and Paul’s small flock is sheered and the wool is spun and dyed by hand. Ellen then weaves the wool using a 72-inch wide, eight-harness Cranbrook loom. Because The Lavender Fields is located in a rural area frequented by coyotes, Ellen and Paul use a guardian llama for the sheep. Five other llamas reside nearby and provide fiber for Ellen’s artwork. When paying a visit to The Lavender Fields, one can’t help but feel serene. The beautiful California scenery, along with the fragrance, and the soothing powers of the purple-flowered plant that make up much of the landscape are intoxicating. It’s no wonder The Lavender Fields is a place on the map for lavender lovers everywhere. 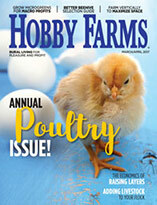 This article first appeared in the May/June 2004 issue of Hobby Farms magazine. 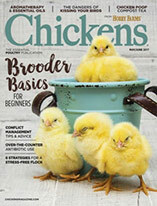 Pick up a copy at your local newsstand or tack and feed store. Click Here to subscribe to HF.